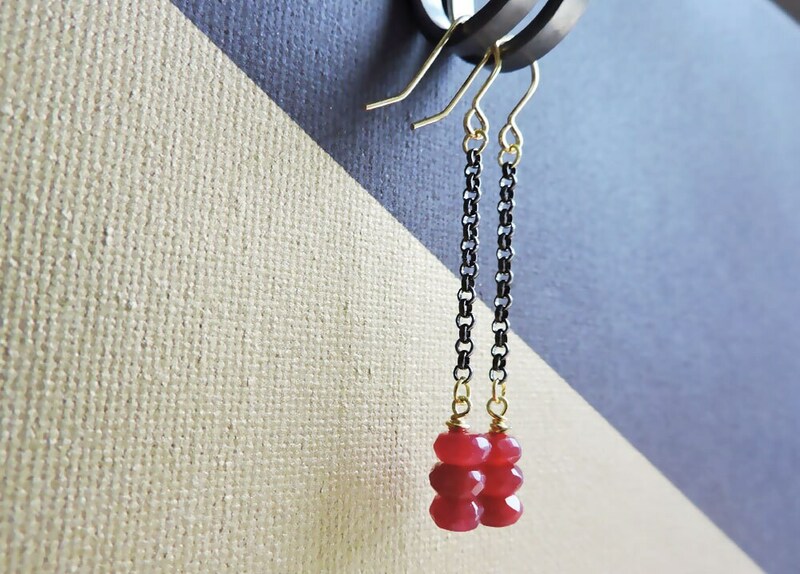 Bold earrings with genuine wire-wrapped ruby briolettes suspended from long black/gunmetal chains. I accept all standard payment methods via Etsy including Paypal and Credit & Debit cards. Please be aware that I will not start work on, or dispatch an order until full payment is received. If you've placed an order but changed your mind, I'm happy to issue a full refund, but please contact me within 12 hours of purchase to request this. If you contact me later than this, it is possible that your order may already be in progress and cannot be cancelled. I aim to dispatch items within 1-3 working days, but during busy periods or in exceptional circumstances this may be slightly longer. If you need something urgently or for a specific date, please contact me to find out whether this will be possible. 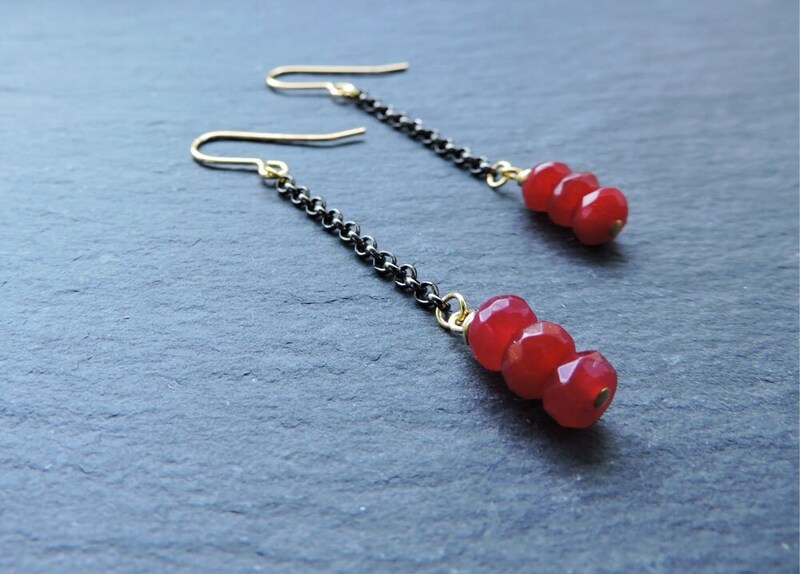 All of my jewellery items are created by hand and almost all items are made to order. Specific production times may vary depending on the complexity of the item so please check the individual item description to have an idea of how long an item will take to create before it’s dispatched. All items are supplied in gift packaging. I'm always open to design requests, so if you have something in mind but can't see an item that exactly matches, just drop me a message and I'll see if I can help. 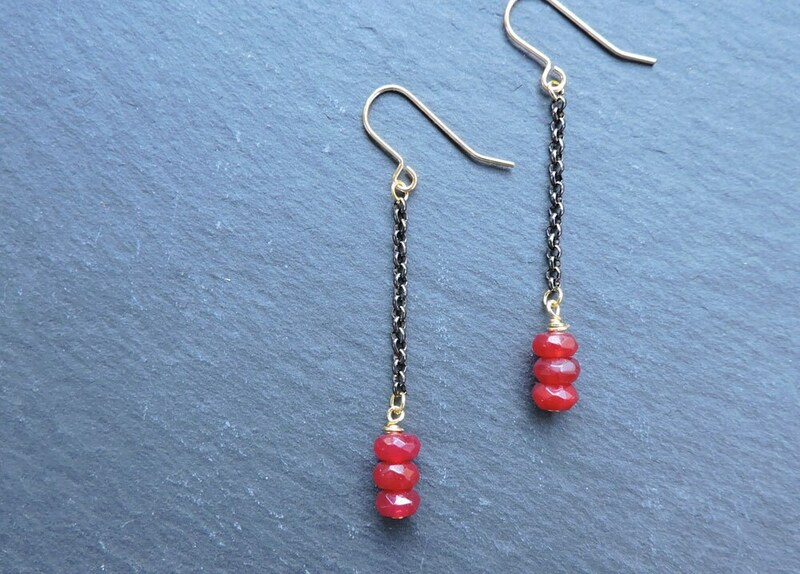 If you see something you like, but would like to request an alteration to an item I have listed, such as changing the chain length or type, or selecting a different stone/pearl, don't hesitate to send me a message and I will set up a Custom Order for you. If you're purchasing multiple items, I automatically provide a discount on the postage fee. The small fee applied is to cover the additional cost of the weight and insurance of the parcel. The available quantity shown for each item is a guide for what is ready to be made and sent within a few days. If you are looking to purchase larger quantities than the available stock shown, this is usually not a problem, but might take a little longer to make. Before you make a purchase, just send me a message stating the item and the quantities you require and when you would need the items by. I will then be able to give you a better idea of cost & timings and create you a Custom Order. *Delivery time is the estimated time from dispatch to arrival, it does not include the production time of the item. All times are estimated and dependent upon the domestic and international carriers delivery speeds. During busier times of the year these delivery estimates may be extended. In almost all cases, you should receive your item within 1-2 working days, but on rare occasions where this is not the case, please allow up to 5 working days from dispatch for your order to arrive. During particularly during busy periods such as Christmas, this may be extended by up to 7 working days. Special Delivery is guaranteed to arrive the next day (from dispatch) by 1pm. If you have paid for Special Delivery, you will have received a tracking code that lets you see where your item is. *Although Special Delivery items are expedited and given priority, please be aware that normal production times will still apply before the item is ready to be posted. Once the item has been dispatched, it will trackable and guaranteed to arrive by 1pm the following day. For most European countries your item should arrive within 5-7 working days. In rare circumstances and particularly during busier periods, an order may be delayed due to the courier, so please allow up to 14 days from dispatch for your item to arrive. All orders for USA, Canada and RoW are now sent via a Tracked Service as standard to ensure safe delivery of your item. You will receive a tracking code that will allow you to check the progress of the item online. Once the item leaves the UK it is in the hands of international couriers, which may be subject to delays during busy times. Please allow up to 20 days from dispatch for the item to be delivered. Please also be aware that customs checks may also be involved when the item arrives in your country, which may also cause delays. I hope that you will be completely happy with your purchase, but if for any reason you aren't, please don't hesitate to contact me so that I can assist you. If you would like to return an item, please post the item back to me within 10 days of purchase for UK & Europe orders, and 20 days for USA/Rest of world. Please just let me know that you're returning an item, so I know to look for it. If the item is received in original packaging and unworn/undamaged, I will issue a full refund. I strongly recommend requesting proof of postage when returning an item as I will not be able to issue a refund unless I receive the item or have proof that it was sent back to me. Please be aware that custom orders cannot be returned (with the exception of requesting a variation such as different chain length). Items such as earrings or anything with a piercing cannot be returned due to hygiene reasons. I take every precaution to carefully pack each item so they won't sustain damage in transit, but in the rare event that an item arrives damaged, please contact me as soon as possible with photographs of the item and I will try to resolve all problems as soon I can. Refund or replacement items may be provided if an item becomes significantly damaged/faulty through normal wear within the first 60 days of receipt. Please contact me with photos as soon as possible should this be the case. Except for exceptional circumstances, refunds or replacements will not generally be provided where an item has been damaged through carelessness, deliberate damage or is beyond 60 days of receipt. 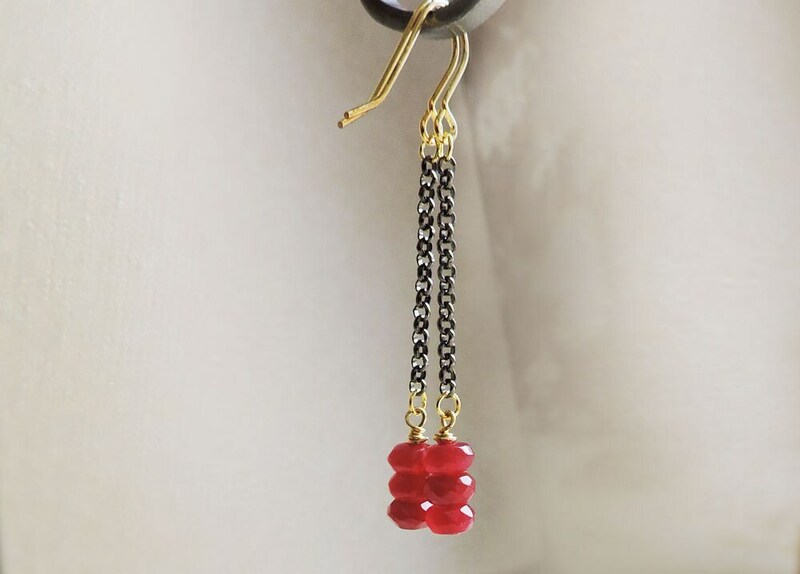 If you are interested in wholesale opportunities, please contact me directly.